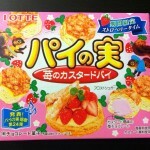 Review: Strawberry Custard Cream Flavour Lotte Real Pie | Oyatsu Break! For those that aren’t already Japanese Oyatsu connoisseurs, get used to the name “Lotte,” cuz you’re going to be seeing a lotte of it. <guffaw> Seriously though, Lotte is a huge manufacturer of Japanese sweets, probably the second-largest in Japan behind Glico (Pocky) and with a range of products that make great headway around the world. They’re most notable for those little chocolate-filled Koala cookies, for Toppo cream-filled Pocky-like cookie sticks, for the hilariously named Crunky chocolates, and for today’s item, Lotte Real Pie. Just a note on the naming conventions–Watashi wa nihongo ga yoku yonde jaarimasen. Which is to say, I don’t read Japanese well (I think that’s what I said anyway, probably missing a particle in there or something). I can get by with google translate, company websites, and a husband who can read all of his katakana and hiragana and about 100 kanji. 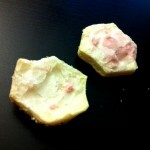 I’m learning, and I’ll get better as this blog continues, but it’s nowhere near perfect. 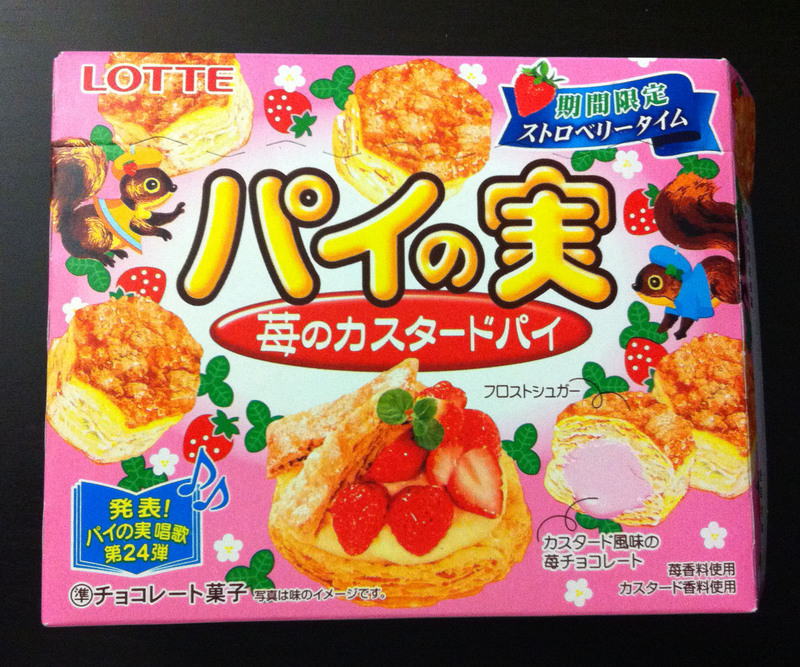 But all of that said, so far as I can tell this item is called “Lotte Chocolate Pie-Strawberry Custard Cream” according to the box, but searching around the internet title seems to be “Lotte Real Pie – Strawberry Custard” so, as always, take my translations with a grain of salt. This is also a limited edition Lotte Real Pie, different than their standard strawberry and released around Christmas time, 2010. Sadly I don’t have one of the normal ones to compare it to, I’ll just have to wing it. 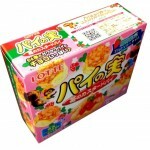 Packaging: The Lotte website describes the packaging of their pies as “childlike and innocent”, and that would explain the Little Golden Books-style squirrels cavorting amongst the strawberries and flowers, interspersed with photographs of the items waiting inside the box–not to mention a photo of an actual strawberry custard pie, musical notes, some sort of music contest, corporate logos and more. I guess what I’m saying is this packaging is BUSY, and I’m not sure if it works. 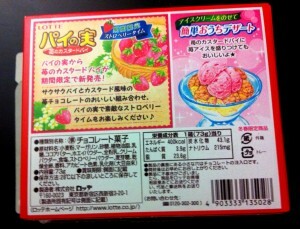 I do love that the back has a serving suggestion of using these as a base for a parfait of strawberry ice cream… aim big, Lotte! 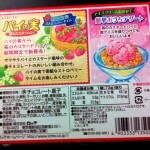 Oh, and also a little description of… I guess the history of strawberry custard? Busy, busy packaging. Oh, and while I don’t really harp on “wasteful” Japanese packaging as I don’t really care, I do think that in this case placing the mini-pies inside a sturdy plastic tray, inside a vaccum-sealed, air-puffed bag, and then inside a carboard box, may have been a bit of overkill. Smell: Immediately upon cracking open the bag, the intense scent of artificial Japanese strawberry flavour washes over you–once you’ve had that flavour you’ll recall it instantly and forever, and North American artificial strawberry just won’t do. I can’t really smell the “pie” part of it because the strawberry is so strong. Taste: The first thing I noticed, and maybe this is the most interesting thing about this snack food, is the texture of the mini-pie. With about 24 of them in the package here and only weighing 73g total, these are light, airy puffed pastries that really go after a flaky pastry texture–and succed! While it’s not quite fresh-out-of-the-oven-puff-pastry or anything, the pastry is light and flaky and layered, adding a decadent feel to these little snacks. I honestly can’t think of a mass-produced north american candy/chocolate snack that’s anything like these. 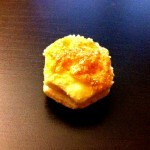 The top of each mini-pie has been browned/sweetened a little, maybe even caramelized. 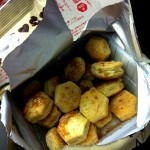 The long trip from Japan hasn’t been particularly kind to these snacks and the tops are crumbling off of the more sturdily constructed bases, but you can clearly pick out a different sweetness from the tops and the rest, which is a nice attention to detail. 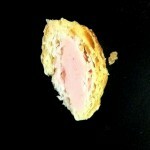 The overall taste of the pastry portion is fine, but unremarkable–not very sweet, or buttery, or anything really. It’s really the added sweetness on top that saves it. Cracking the pies open reveals a nice dollop of strawberry cream, with that one note of Japanese Strawberry Candy flavour filling my mouth nicely. 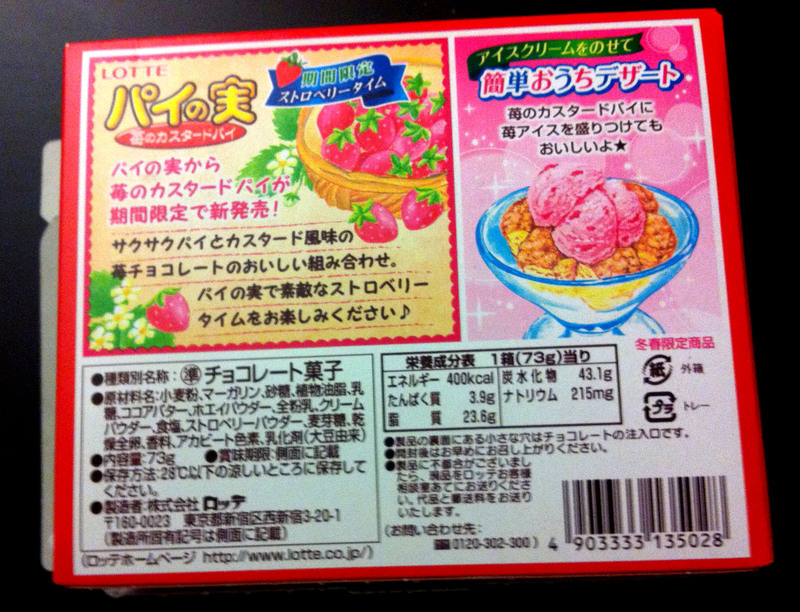 I can’t taste anything that would make it custard per se rather than regular strawberry, but it is appealing. The overall ratio of cream to pie might be a little off though–the pastry is the first thing you taste in your first mouthful, and it it’s a couple of chews before the sweetness of the custard kicks in and brings everything together. Verdict: I’ve tried the chocolate version of this in the past, and I wonder if I might like the strawberry a little bit better. In both cases the pastry is a touch bland, but the strawberry is just such an intense flavour that it makes it all work. 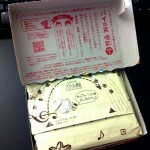 All in all it’s a really nice little sweet, ideally suited to a warm drink like a coffee or unsweetened tea. I came across one Japanese blogger who described this being their breakfast-of-choice one morning, and honestly I’ve had much sweeter cereals–it might be a great start to the day!